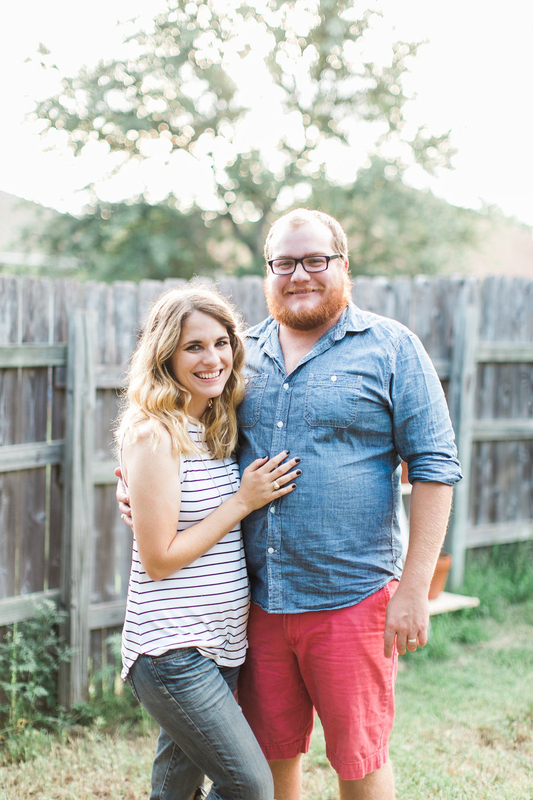 If you’ve been following along on the blog for a while now, you know that our poor garage has been going through a bit of an identity crisis. 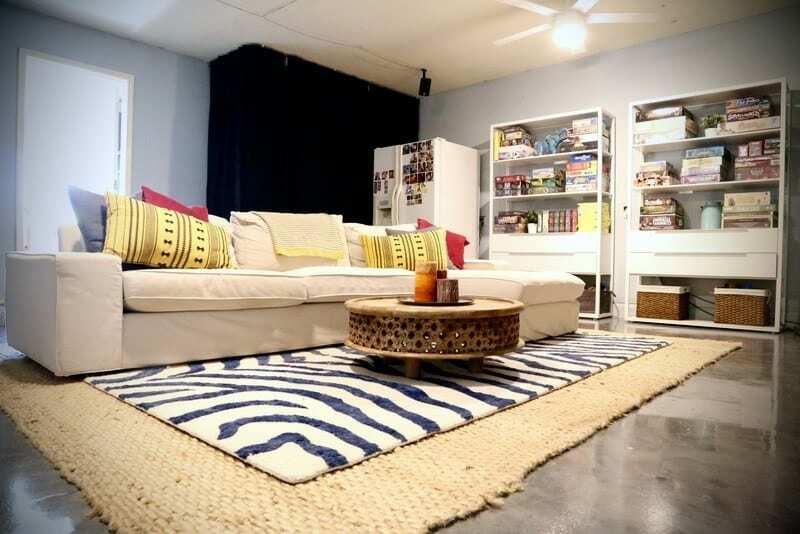 First, we turned it into a media room, then we hated how it looked so we gave it a makeover. We absolutely loved it, but our city is nosy and controlling and they said we can’t have it. So, we had to undo all of our hard work and turn it back into a garage. I’m calling it the garage un-renovation. We were (and still are) pretty annoyed about how things turned out, but I do have to admit that we’re now at a point where we’re honestly pretty excited to have this space be so organized and functional – and to have an entire room where we can store things again! 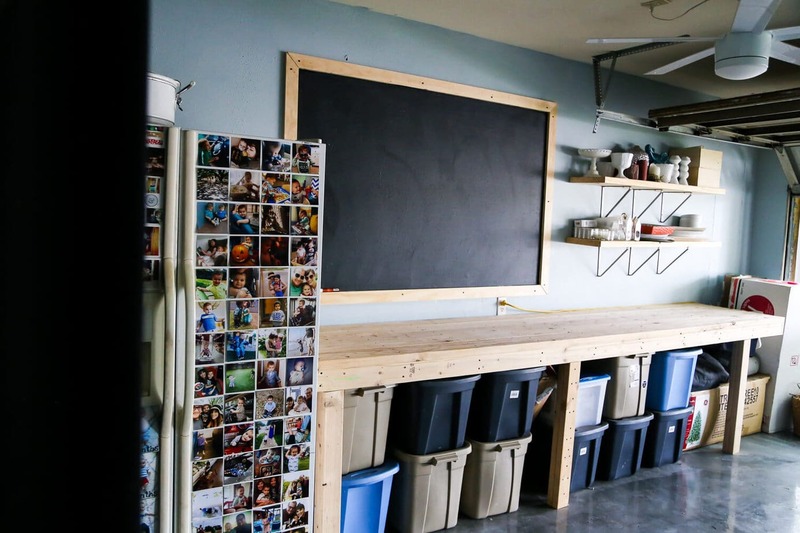 This post is sponsored by Rust-Oleum, but all enthusiasm about organization, awesome flooring, and chalkboards are all me. Whew. What a change, right?! So, what did we do in here? Well, for starters, we took down the wall we built and removed all of the furniture. That was a big one. Then, we added Rock Solid flooring to the part of the room that was behind the wall before – I’ve said it before and I’ll say it again: I am so glad we put this flooring in here. It’s practically indestructible, it looks freaking amazing, and it feels so good underfoot while you’re working. I absolutely hate dusty concrete floors, so this is such a luxury for me. I anticipate spending a whole lot of time in here working on projects, and as silly as it might sound this flooring makes it 1,000% more enjoyable to be in here. Let’s get into the details of the room – starting with the main hub of the whole room – the workbench. Seriously, where is that heart-eyed emoji when you need it? I’m so dang excited about this space, I can’t even contain myself. 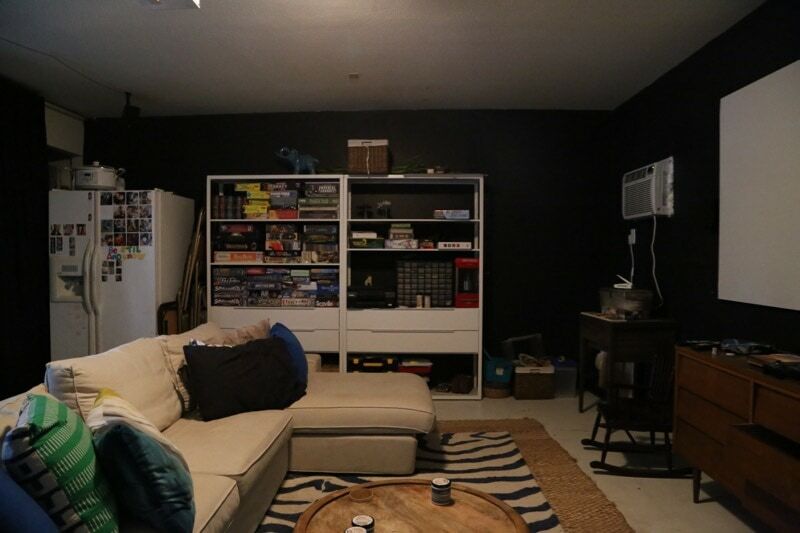 I think we all know I am seriously missing the amazing media room that we used to have, but there’s just something about an entire room that I can dedicate to storing my crap, working on projects, painting, and getting some fresh air while I’m at it that makes me so incredibly happy. Let’s break down the details here – Corey and I brought in this giant workbench that he built last year for the workshop. There are two in there, and he felt like he wanted a little more room to move around and a little less workbench space, so we decided to just re-use this one in here. It’s the perfect size for this wall, and it looks like it was made just for this room. Underneath, we’ve got all of our Christmas and other seasonal decor. Eventually, I’d like to get all matching tubs for everything (am I the only one who gets a little twitchy looking at the mismatched ones?) but this is real life and I haven’t gotten around to it yet. On one side of the workbench, we’ve got a mega-giant chalkboard. It’s 6 feet long, and 4 feet tall. 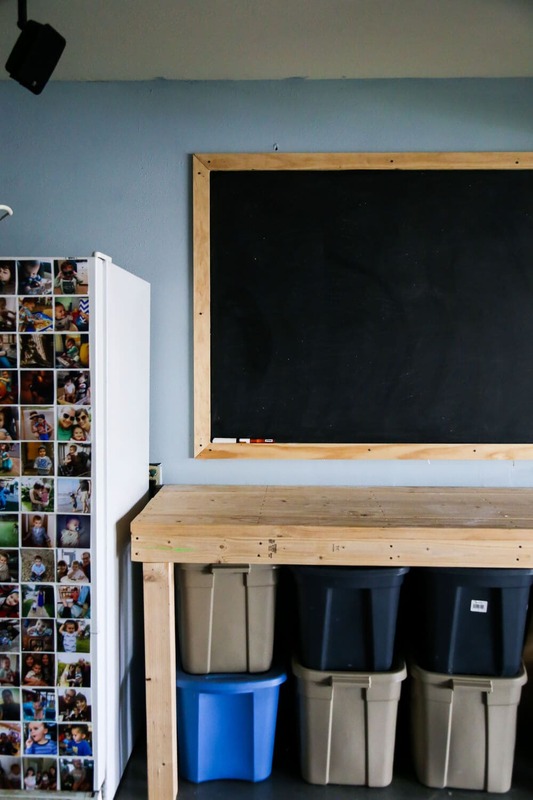 You can see all of the details for the DIY blackboard on that blog post if you’re interested (it’s laughably simple, I swear) – I’m so ridiculously excited to have it. It’s a great way for me to be able to take quick notes and keep things organized while I’m working in here, and it’s super cute too. 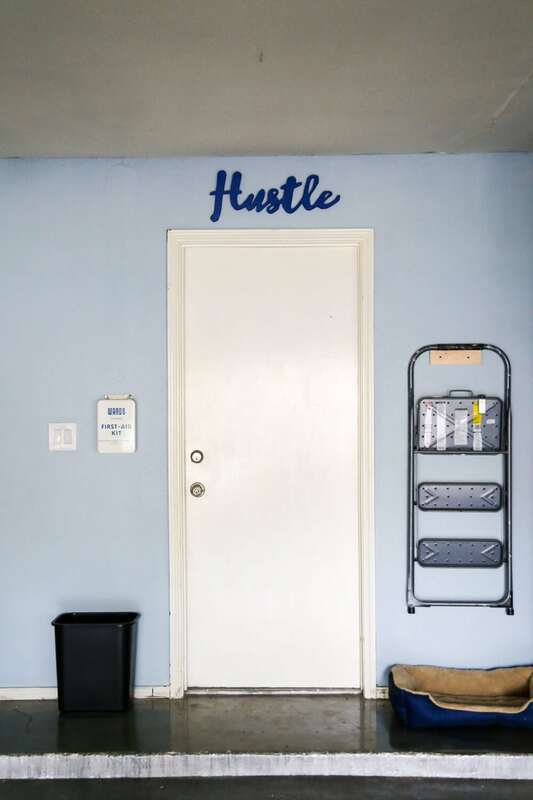 We used Rust-Oleum products for the chalkboard as well – their chalkboard paint is the absolute best (and I’ve tried a few!) and it functions just as well as if we had bought it at the store. Except, of course, I’m pretty sure it’s hard to track down a 6-foot chalkboard from a store. 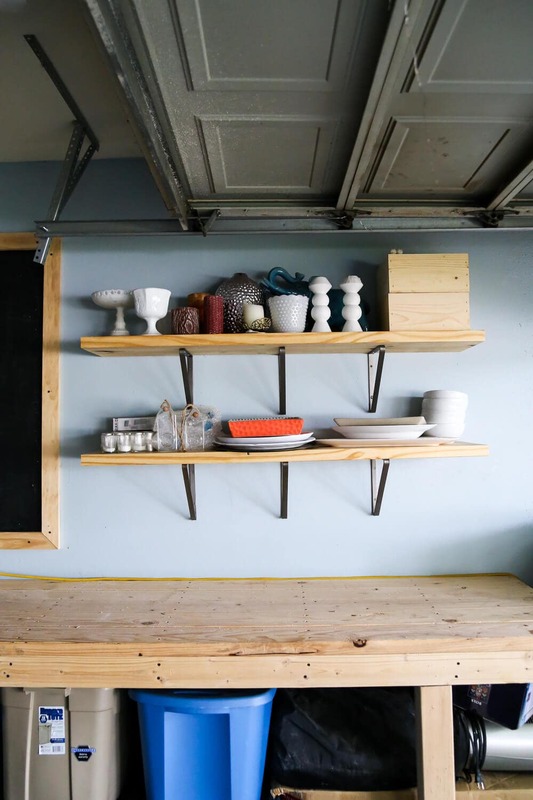 On the other side of the workbench, we have some super simple open shelves to store decor that we aren’t using and pieces for upcoming projects. I can’t even tell you how nice it is to have a dedicated spot specifically meant to store vases and other decor that I’m not actively using. I used to feel like I had to keep everything sitting out all of the time because I didn’t have anything else to do with it. Now I can easily swap things around as often as I want, and I don’t have to worry about finding a place to keep the things I’m not using. Oh, and one of my favorite little details in this room is the fridge. It’s an ugly, dingy, dirty old fridge and when it’s not covered in photos it looks downright embarrassing. But, tape up a few dozen pictures and suddenly it’s an adorable little time capsule that makes you smile every time you look at it. 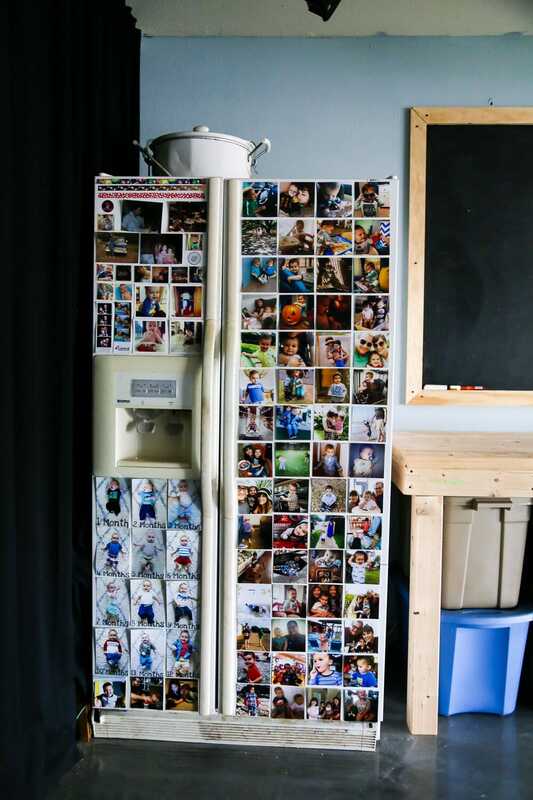 So, if you have an ugly refrigerator, cover the entire thing with photos and you’ll hate it a lot less. Don’t say I never give you any awesome tips. This is what the other side of the garage looks like. 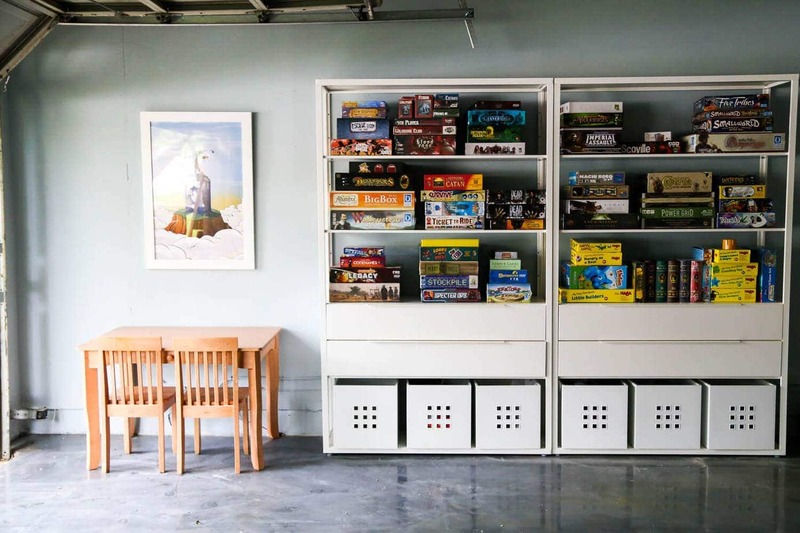 We’ve got these two metal IKEA bookcases that store all of our board games. Yes, those are all board games. We have a problem. I’m aware. The little table next to the shelves was a last minute addition that I’m really excited about. My mom grabbed this cute little kid-sized table from a garage sale and it’s the perfect size for this little corner. Jackson loves to sit at it and draw or play with Play-Doh while I’m working, and it’s a great way to keep him happy when I’m busy with a project in the garage. 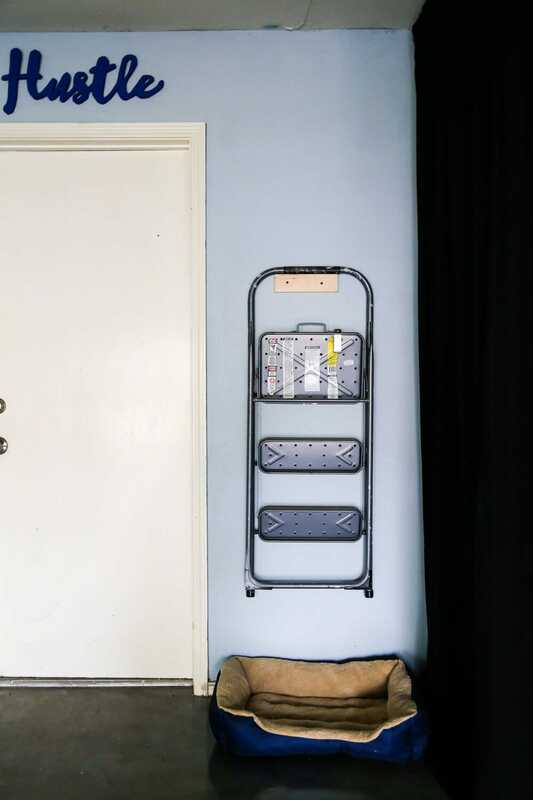 A few more little details: we hung an old metal first aid kit on the wall by the door, along with our step stool. It turned some boring dead space into a super functional little area, and it keeps our clunky old step stool off the floor (finally). All I did to hang the step stool was take a small scrap piece of wood (it’s a 1×3 board), cut it down to be about the same size as the rubber grip on the top of the step stool, and screwed it into the wall. The depth of the wood is almost exactly the same as the step stool handle, so it rests perfectly on there and, thanks to the no-slip rubber grip, it doesn’t ever fall off – even if the door gets slammed. I love a super simple solution to a storage problem, don’t you? Oh, and we have a little dog bed in there in case Cullen wants to hang out while I’m working out there. Of course, I usually have the garage door open, so he’s more interested in chasing the other dogs walking on the street, sniffing every square inch of the front yard, and peeing on literally every single blade of grass he can find. I’m pretty thrilled with how it turned out, and literally the day we finished it I started using it to work on projects – I’m loving it. I was kind of concerned about how the new Rock Solid flooring would blend in with the old stuff, but you literally can’t even tell the difference between the two. I have seriously noticed neighbors slowing down and checking out our gorgeous shiny floors while I’m working in there, and I’m pretty sure everyone in my neighborhood is jealous of my garage now. I don’t blame them. I’d be jealous too. There are still a few small to-dos we need to take care of in here. 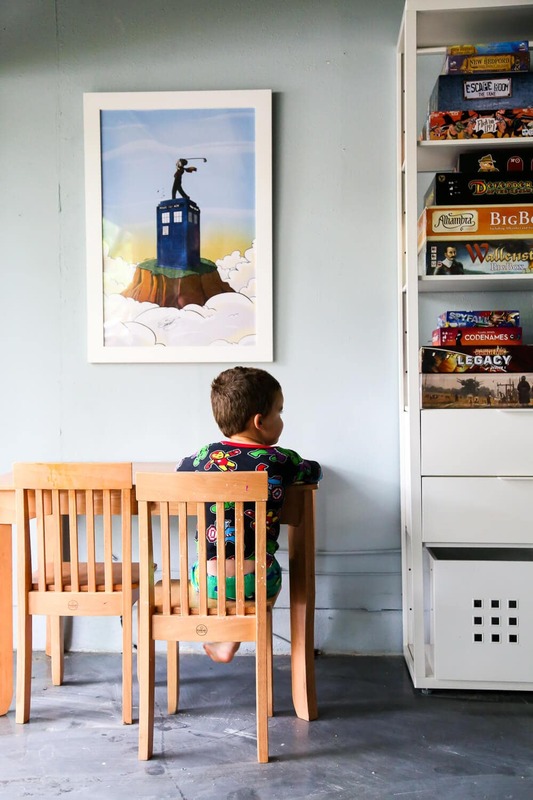 If you saw my Facebook Live the other day you saw the biggest one – there’s a little nook in one corner of the room (it’s under our staircase) that is currently just filled to the brim with junk. We’re going to build some shelving or something in there to organize everything, so I’ll definitely be back to update you on that when it’s done. Side note – I’m having a blast with Facebook Live lately over on our page and I’m always looking for ideas for what to talk about. Be sure to like us on Facebook if you don’t already, and let me know what you want to see more of! Anyways. 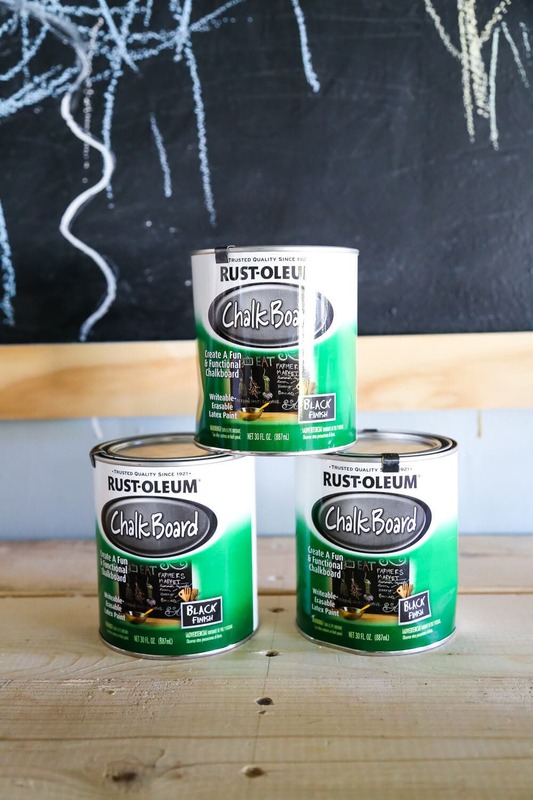 We’re so thankful to Rust-Oleum for working with us on this space and we can’t say enough good things about their products. We’ve been mega-fans of them for years and years and we’re pretty pumped to have the honor of working with them on projects like this. In fact (spoiler alert!) you’re gonna want to check back in next Monday for another project we did with them. It’s gonna be amazing. Of course, I might be biased. But I promise, you’ll love it. 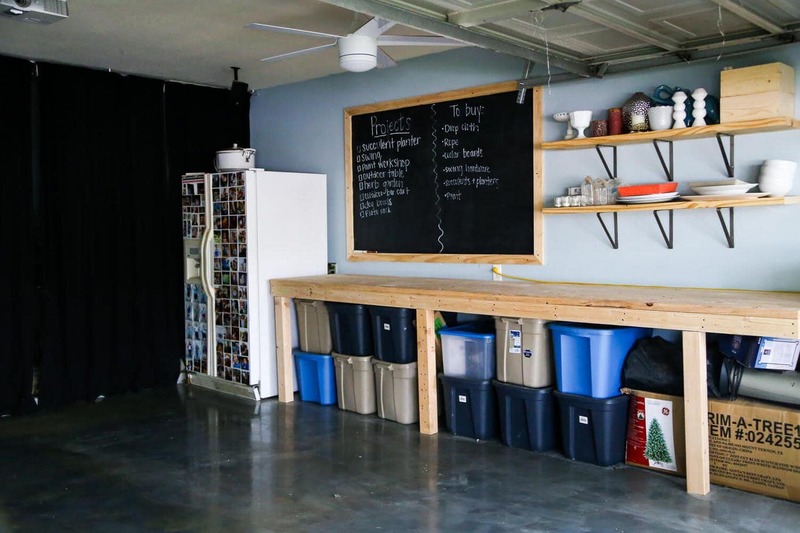 I’m curious now, though – how do you use your garage? Do you park your cars in it or work in it? Have you converted it? Spill the details! 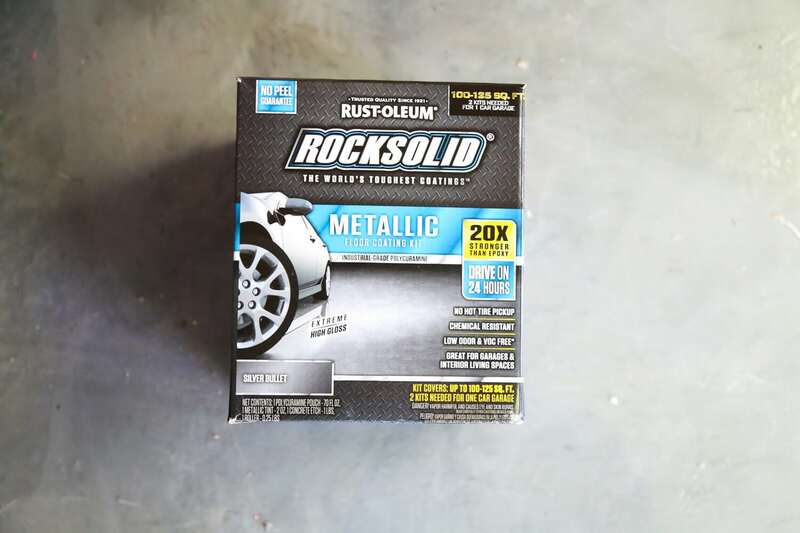 And be sure to check out Rust-Oleum’s Rock Solid flooring if you’re thinking about upgrading your garage at all. You will not regret it. This is one of the most organized garages I have seen, thanks for the inspiration, off to clean mine. I love that floor. 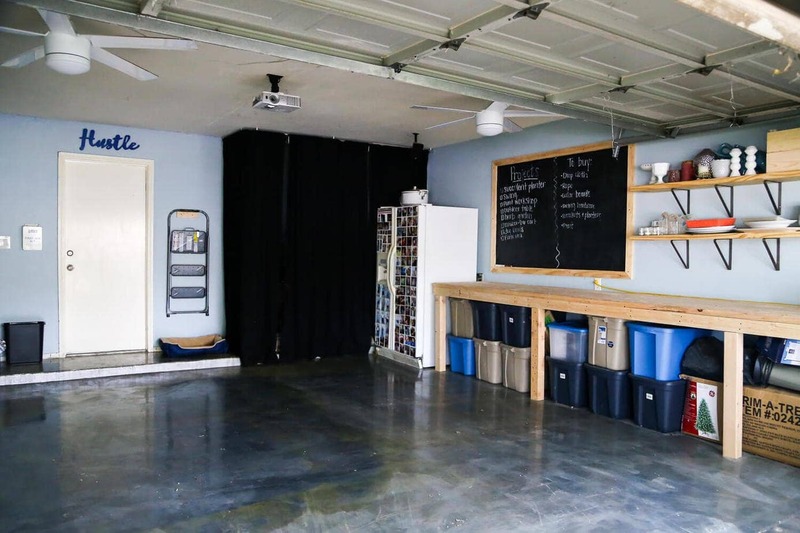 We have been considering doing something with our garage floor and weren’t sure, but this is great information and the direction we should go. Your garage looks amazing. I’ve enjoyed the series you have on Facebook! I would LOVE LOVE LOVE it if you could do a video about small tools. I want to do household projects (like I need to build a magnet board to cover the ugly breaker box in our entryway), but our house doesn’t have the storage for large power tools. …Our house barely has the storage for gardening tools, actually. I would love to see a video about small tools you need to do basic projects, if you could make it happen. And YES, we love Pandemic: Legacy! We actually haven’t finished it yet – it’s been a while since we’ve played. We still need to finish! Our garage is small, but I still use it for projects (our mitre saw is in there) AND for storage AND it holds my car. 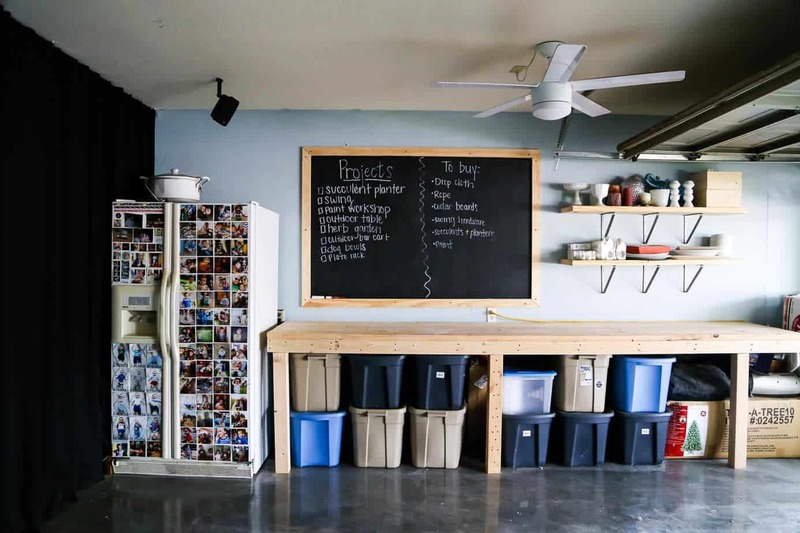 I’m hoping we tackle the floors this summer, because let’s just say they’ve been a good spray painting canvas 🙂 Oh, and you totally don’t need all new bins – just organize/place them by colour so they make a cool pattern! Oooh that’s smart! I should try re-arranging them! 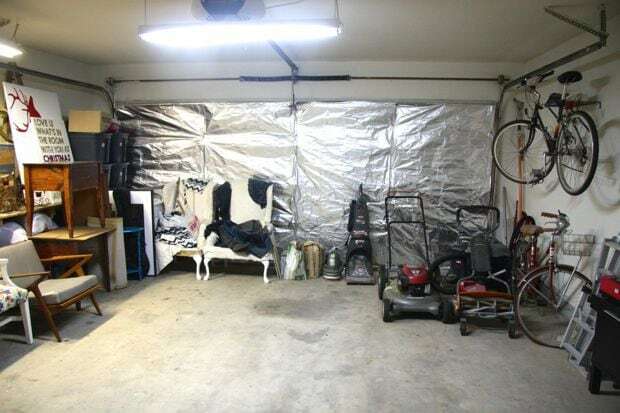 Your garage looks awesome! It went through many transformations and the media room looked awesome too! We are trying to figure out our garage. We have wall to wall “stuff’ in the garage AND we can currently fit our two cars in the garage. BUT I want to upsize my sedan to an suv and its trying to make it work around that. I love the flooring! Rust-Oleum products are amazing. 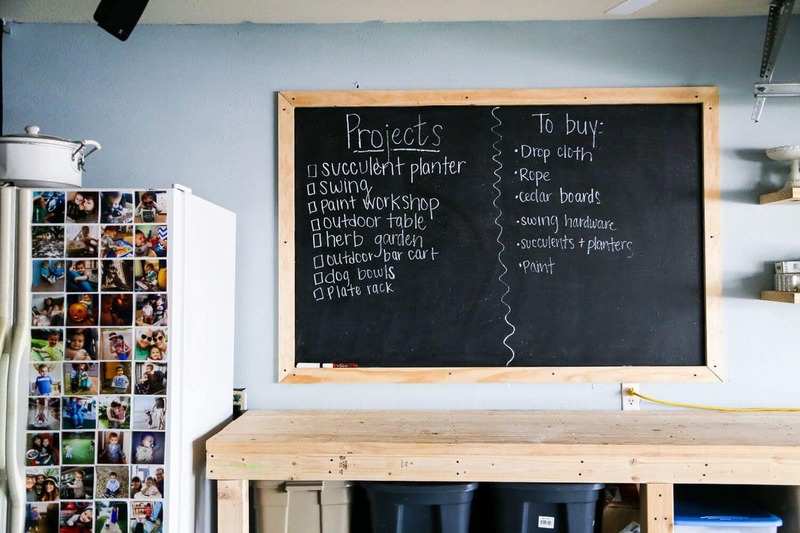 Also the Chalkboard idea in the garage is such a clever idea!! Thanks, Lisa!! The flooring is our FAVORITE!